The NASA spacecraft Dawn has spent more than seven years traveling across the solar system to intercept the asteroid Vesta and the dwarf planet Ceres. Now in orbit around Ceres, the probe has returned the first images and data from these distant objects. But inside Dawn itself is another first – the spacecraft is the first exploratory space mission to use an electrically-powered ion engine rather than conventional rockets. Such ion engines will propel the next generation of spacecraft. 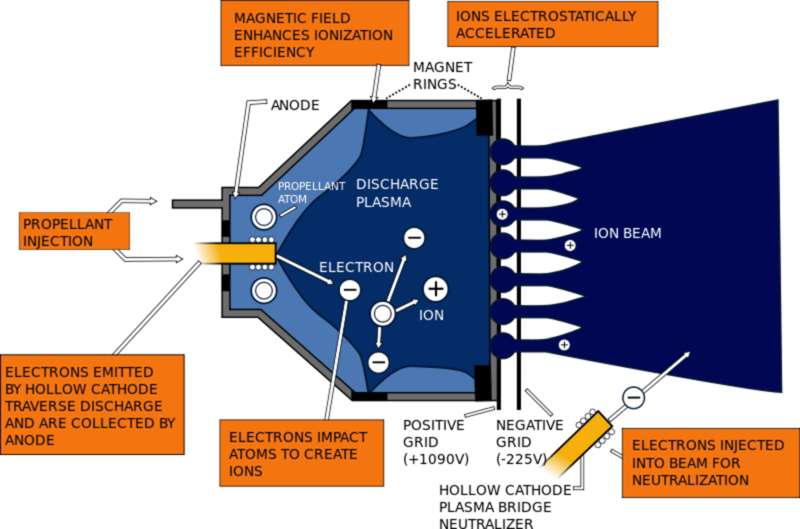 Ion engines use electric power to create charged particles of the fuel, usually the gas xenon, and accelerate them to extremely high velocities. The exhaust velocity of conventional rockets is limited by the chemical energy stored in the fuel’s molecular bonds, which limits the thrust to about 5km/s. Ion engines are in principle limited only by the electrical power available on the spacecraft, but typically the exhaust speed of the charged particles range from 15km/s to 35km/s. What this means in practice is that electrically powered thrusters are much more fuel efficient than chemical ones, so an enormous amount of mass can be saved through the need for less fuel on board. With the cost to launch a single kilogram of mass into Earth orbit of around $20,000, fuel savings can make spacecraft significantly cheaper. This can be of great benefit to commercial manufacturers of geostationary satellites, where electric propulsion can allow them to maneuver adding new capabilities to the satellite during its mission. And for scientific missions such as interplanetary travel to the outer regions of the solar system, electric propulsion is the only means to carry useful scientific payload quickly across the enormous distances involved. Electromagnetic engines ionize the propellant by turning it into an electrically conductive plasma, which is accelerated via the interaction of a high electrical current and a magnetic field. Known as pulsed plasma thrusters, this technique is in fact quite similar to how an electric motor works. Electrostatic engines use an electric field generated by applying a high voltage to two grids perforated with many tiny holes to accelerate the propellant. Called a gridded ion engine, this is the type that powers Dawn. Another electrostatic design is the Hall effect thruster, which operates in a similar fashion but instead of high voltage grids generates an electric field at the thruster’s exit plane by trapping electrons in a magnetic field. The concept of electric propulsion has been around for 50 years or more, but was deemed too experimental to commit to major projects. Only now is it beginning to find real applications. For example, keeping geostationary satellites in their correct orbit, to counteract the aerodynamic drag from the very tenuous atmosphere 200km above the Earth. Or interplanetary missions such as Deep Space 1 – the first experimental mission to use ion engines, it was originally intended as a technology demonstrator but performed a successful flyby of the asteroid 9969 Braille and the comet Borrelly 15 years ago. Now that electric spacecraft engines have entered mainstream use, they look set to reduce the cost of deploying satellites. With compact ion engines on board, satellites can raise themselves from low Earth orbit to their final geostationary orbit under their own power. This will save enormous amounts of fuel and allow the use of much smaller launch vehicles which will save a lot of money. Boeing was the first off the blocks in 2012 with an all-electric version of their 702 platform satellite fitted with xenon-powered gridded ion engines, and other satellite manufacturers are following suit. Currently all electric power designs use xenon gas as the propellant, but the search is on for alternative propellants since xenon is enormously expensive and in limited supply. But electrical power is here to stay, and over the longer term, space tugs and even manned missions to Mars based on nuclear electric propulsion will be the next on the drawing board. Ion engines have their advantages, but there are times and places where conventional rockets are advantageous. Ion engines are incapable of really exploiting the Oberth Effect due to their very low thrust, which means a space probe with only ion engines is limited in its ability to get gravity assists. Meanwhile, a small burn by a rocket motor can produce huge effects deep in a planet’s gravity well. Low thrust spirals away from planets – like used by the Boeing 702 – require twice the change in velocity as short, sharp high-impulse chemical rocket burns. (Of course, ion rockets can afford that inefficiency.) However, that might mean much longer times passing through the radiation belts, assuming the launcher didn’t give a large boost toward synchronous orbit. Ion engines are also unsuited for reaction control systems unless you’re really patient with reorienting your satellite/probe/ship. Conventional chemical rockets can really snap you around, if you need that. Of course, so can reaction wheels, so conventional motors are hardly the only alternative here. True. Could you imagine how dull the space battles in Star Wars would be if the Twin Ion Engine (TIE) fighters actually accelerated like the real thing? But for long cruises where acceleration isn’t a priority, they’re extremely efficient. I do recall reading about the VASIMR plasma rockets that former astronaut Franklin Chang-Diaz was working with, and how these might provide a better compromise between quicker acceleration and efficiency. They seem like ion engines on steroids. Liquid metal ion or mist guns (gallium, indium, cadmium, bismuth), then an accelerator cascade (and an electron gun to keep the spacecraft charge-neutral), e.g., US8525125 B1, US7956336 B2, US7435972 B2, US7420181 B2. Nuclear propulsion demands shielding, measured in mass/area. Like the unlamented Space Scuttle, your payload will largely be your otherwise useless vehicle. The shuttle is very lamented. Its drawback was high maintenance, not performance. Except for Buran’s single flight, there’s been no spacecraft capable of such transatmospheric performance, high cross range, 25 tons of payload, and orbital manned endurance. As for nuclear propulsion’s shielding, that depends on the spacecraft. Shadow shielding gets very lightweight while offering high alphas as you nudge into megawatt range, enough to outperform existing solar-electric systems. I know a retired Rockwell engineer who was deep within. Nobody knows the cost of Space Scuttling a kilogram into LEO. Nobody. The program was frank criminality plus politics (re Europe’s SST), plus Black Ops embroidery. “transatmospheric performance” Aw, c’mon! Spreadsheets says “use and lose.” There is no imagined profit in space except orbit. “25 tons of payload” Put eight Space Scuttle boosters around a Saturn MLV-V-3 (with modern metallurgy and engines, maybe JP-10 in the tank: 700 tons payload. Moon colony. NR-1 nuclear submarine weighs 400 tonnes fully loaded with a crew of 12. Swap propulsion plant and underwater whatnots for a water cargo (electrolysis) and a bilge of military MREs. All compartments have pressure bulkheads and hatches. Pressure-sealed toilets are SOP. It’s always fun to indulge in alternate histories and fictional worlds where the Saturn V was developed to its full potential. A bit of a topic change from what I was getting at, but interesting nonetheless. wowee..you just know it all..I bet you are in constant demand..
Post a substantive counter-argument. You can’t. You are like the wicked black monkey – all cushy talk, no hard action – or disaster, for you know nothing of cause and effect, or history when being illiterate, innumerate, and borderline retarded are Authenticity. I am like the wicked black monkey and you are like the counter talk cushy effect caused by history, authentic,innumerate,retarded, disaster, of which you know no hard action or illiterate borderline for sure…Authenticity..yep..
Ion engines using heavy metals, from Mercury to each of the ones you mentioned, have proven costly to develop, because they are such environmental contaminants. That is the biggest reason for using Argon and Xenon. Their heavy ions mitigate the major problem with ion engines, which is the limitations of space charge effects, without being poisonous inside our biosphere during testing. Space charge limits the number of ions that can occupy a given volume at any one time. This limits the mass/thrust ratio of ion engines badly. The heavier each ion is, the more thrust you can get from an engine with a given volume. Temperature limits of thermal rocket engines’ material structures limit them similarly. Other propellant alternatives may be analogues to the 60 atom “Bucky Balls”, using different elements than carbon. Bucky Balls themselves fall apart at the energies involved. However, it is not impossible that other elements, from Boron to Molybdenum may be used, if they hold together better. If not Boron, then Boron Nitride. Lastly, once we are developing ion rockets in Space itself, if we have access to the metals you named, we may *then* see substantial development with them as ion engine propellants. If there is no biosphere to pollute, then the problem does not come up. That type of change will happen often as R&D shifts off Earth. Can your author please proofread your “scientific” article before publishing? Really, tenuous atmosphere for geosynchronous satellites at “200km”??! More like 30 THOUSAND km! Are the voltages right in your diagram? There’s a missing “and” or “or” from the statement about counteracting drag at 200km. Remember GOCE, also mentioned in this article, which used ion engines to counteract the drag at 200km? And, yes, the voltages are correct. That’s a staple NASA diagram of one model of ion engine it tested years ago. It isn’t universally true for all models of ion engines, but it is for some. Yes, I remember and thank you for the clarification. The problem with the ion drive is providing enough energy for it. If you increase the exhaust velocity by a factor of 7, you get 7 times the momentum change out of the rocket, and build speed 7 times faster, but the energy it takes is 49 times greater. To carry humans to Mars in a faster time takes a large amount of energy that would require a fission or fusion reactor, and not one of those small kilowatt jobs. They are good for pushing small satellites around slowly, at low mass cost, using energy from solar arrays or small nuclear reactors. Ion thrusters have an input power spanning 1–7 kilowatts, exhaust velocity 20–50 kilometers per second, thrust 20–250millinewtons and efficiency 60–80% making them viable to small craft not really a futuristic means traversing manned space craft vast distances. However I have been thinking or should I say wondering what about the possibility of combing both methods your ion thrusters coordinated with the more traditional chemical propulsion system wouldn’t that be an interesting option to explore/experiment with. I don’t know guys ye are the experts I am more of an enthusiast. However wouldn’t mind some qualified thought on this? Why are the Solar Panels arranged like “Wings” instead of being along side like a TIE Fighter’s Panels. It makes more sense to have them along side, and they’d pick up Energy from all directions. Maybe the designers are just worried they might be called ridiculous for the same reasons some readers might think of what I’ve just said. in my case, I say. . . WHO CARES? If it works? Good! That’ll shut the doubters up. Also, sorry I’m not a Scientist and understand what’s going on, but I think I have enough understanding to be able to read the article with some fascination. I Wish this Project the Best of Success, especially when they adopt the new Zero Point Energy that Tesla discovered. Remember his car with the “Magic Box” Receiver of Energy from the Ether? FREE Energy from OUT THERE! Created MORE Energy than it USED!! That’s what I read anyway. Pity he’s no longer around. Tesla was a bloody GENIUS!! Seems pretty much like an interplanetary vacuum tube. I thought chemical fuel & engines could give you huge total thrust for a short time, while ion engines put out low thrust, for long times. True? or not? What if we built an electromagnetic track around the circumference of the moon? We could then accelerate a spacecraft to a very high speed. In theory it would only be limited by the strength of the materials holding the craft to the track and the centripetal acceleration that the craft/people could endure. The energy could come via the sun via a solar sail that would be positioned with it’s reflective side face toward the sun. In that scenario you would not even need the track to be an electromagnet. You could simply keep it like a simple rail track. Or if you did do the electromagnetic rail you could simply gather the energy via solar panels. Since there is very little atmosphere around the moon I don’t think friction would be much of a concern. Based upon my calculations for people (tolerate ~20g), radius of the moon is 1,737m, then the velocity that would be achieved would be 5888 m/s…which means that the craft would arrive at mars in 1.2 years. Now that isn’t exactly quick but…if we could increase the tolerance for acceleration or used robots the time required would quickly drop. Or if we added an additional propulsion system. The best part is that you could make the craft as large as you want and accelerate it as fast as you want. I also have sent an Idea regarding a deep space propulsion tech which can obtain 10000000 to 40000000 kilometer per hour speed or more .A radical tech to change space missions for ever. see my Idea regarding Deep space propulsion tech on ‘create the future design contest’.A revolutionary tech to change space missions for ever as this tech can obtain upto 40% of speed of light and there will be no need of on-board propellent to drive this engine. This paper is undoubtedly flawed as Ion engines could never provide enough thrust to exceed the weight of the engine. Why? This is because of earths gravity, it’s simply too strong. Moreover, it would seem un-logical to have ion engines trying to leave the atmosphere when the whole point of the ion engine is to provide an efficient, small and constant amount of thrust which allows the spacecraft to accelerate in space for up to 8 months at a time. This means that unfortunately, for the time being, spacecrafts will have to rely on combustion engines huge thrust to escape the atmosphere.